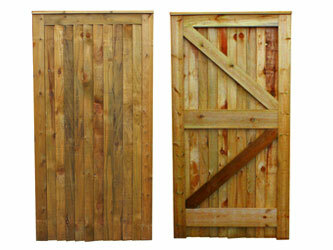 These Closeboarded Gates are manufactured from 45 mm x 85 mm frame-work clad with feather-edge boards. Capping fitted to top edge. Can be hung as singles gates or as pairs. Brown-tanalised, pressure treated. Recommended Gate Post size is 4" x 4". For post height use 2 ft more than the height of the gate to permit foundations.